The actor: Versatile Welsh performer Michael Sheen, who’s apparently following in the footsteps of fellow Brits like Michael Caine and Judi Dench by seemingly never turning down a role. He’s taken leading roles in highbrow, awards-bait fare like The Queen and Frost/Nixon, but can also be seen hamming it up as a werewolf leader in the Underworld trilogy, a vampire lord in the Twilight movies, a rakish sybarite in Tron: Legacy, and so forth. At least he always seems to commit to the serious roles, and have a lot of broad fun in the more ridiculous ones. But he’s more about commitment than fun in his latest, Beautiful Boy, a painful, poignant drama in which he and Maria Bello co-star as the struggling parents of a college boy who kills 21 classmates before turning the gun on himself. As always, Sheen gives a terrific, intense performance as a father and husband who’s falling apart. 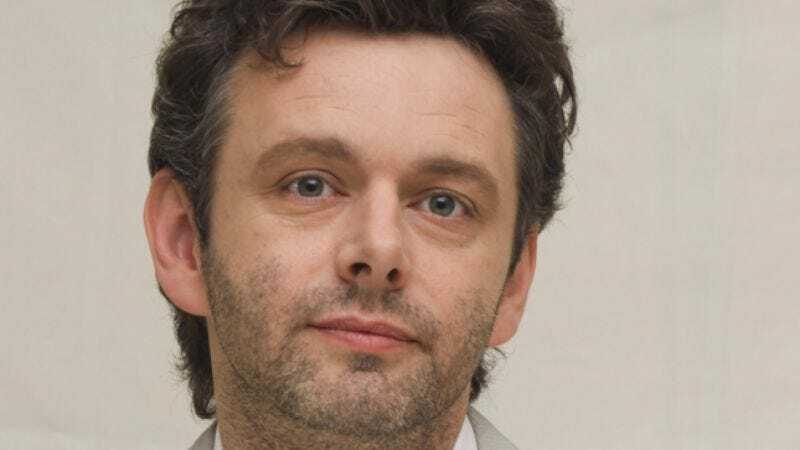 Michael Sheen: The journey, the whole journey of it—starting on a small stage at the Donmar Theatre, doing a workshop reading of the play at a point where David Frost ended the first half singing a song. Ultimately to doing a production at the Donmar, then at the West End, then on Broadway, and then the movie of it, and then being at the Oscars with it—it was an extraordinary journey. AVC: Was your rendition of David Frost notably different over those changing spaces, in those changing versions? MS: Yeah—well, hang on. The demands of each were different, even the different-sized theaters, and then theaters in different countries, and that kind of stuff. There was a big adjustment each time, so that was the most extraordinary relationship you end up having with a story, doing it in so many different ways, with different casts as well. I had three casts I worked with over the whole period. It was an extraordinary way of getting intimate with a particular story and character. AVC: Did you feel like you were refining that role every time, or just transposing it for different media? MS: No, I think my understanding of it deepened each time. Obviously, when different actors were playing different parts around me, I was still the same character, but I was revealing different parts of the character depending on what I was reacting to all the time. If there are different actors playing different characters around you then you change as well, so it wasn’t just about changing it for the medium. No, you discover parts of the character. MS: That’s a character I just find really, really fascinating. I’m a big fan of vampire movies generally, and that sort of tradition of characters. So being able to have my own take on a character, and being someone who taps into all the things that really frightened me when I was a kid, like Child Catcher from Chitty Chitty Bang Bang and The Blue Meanies in Yellow Submarine, and [Laurence] Olivier’s Richard III on film. All these characters really stayed with me and disturbed me in some way, and yet sort of thrilled me. That’s what I always tend to draw on when I play that character. And also, the level of excitement and passion that the audience has. My own daughter is a big fan of the Twilight stories, the books. So that’s the other thing—it’s the first time I’ve done something my daughter actually actively had an interest in. AVC: Have you gotten caught up by the fan mania that’s hit some of the people involved in the series? Robert Pattinson and Kristen Stewart have had fairly complicated lives since they started doing those movies. MS: I guess they have, yeah. I don’t get any of that, probably because the audience for those films, I don’t think on the whole, know other things I’ve done, and certainly wouldn’t recognize me if they saw me walking down the street. So I get away with all that. AVC: Is it ever strange going back and forth between playing serious, buttoned-down, real-life people and playing outsized fantasy roles in Twilight or Tron: Legacy? MS: No, that’s why I got into acting in the first place. It’s the variety and the challenge of doing different things and playing different characters. It’s all one big dressing-up box. MS: [Laughs.] The Queen, that was… no wonder it’s something. You have such a long journey with these films, there’s so many different things. I guess, in a way, what was most important about that was that it was the beginning of my collaboration… Well I did [the TV film] The Deal with [director] Stephen Frears and [writer] Peter Morgan, and that was the first thing I had done with Peter. But The Queen was on another level. So in terms of the first movie, the first cinema film I’ve done as part of the collaboration with Peter Morgan, The Queen cemented my relationship with him. He’s had such a big effect on my career, as has Stephen Frears, who directed that as well. So that was a very exciting collaboration. And that was the first time I had ever been in something that ended up at the Oscars, as well. So being a big part of that whole journey for the first time was very exciting and interesting. AVC: Was Othello your first film role? MS: The first one I ever did was with Stephen Frears, a film called Mary Reilly. Stephen directed, and Julia Roberts and John Malkovich are in it. AVC: Ah, that came out the year after Othello, but was filmed earlier. What was that first experience like? MS: It was fascinating. I discovered much later that it was quite a difficult shoot for everybody, for various reasons. But because it was the first time I was seeing all that happening, seeing just how a film got made, I was just fascinated by it all. Although, I was very nervous whenever I had to actually do anything in the film, because I just felt so much pressure, you know, to get it right and not mess it up. So it was quite a nerve-wracking experience, as was being around Julia Roberts, who was lovely, but you know, a huge star. It was all so new and exciting and interesting. MS: That allowed me to spend a bit more time in front of the camera, so I started to relax a bit more, and I felt a bit more involved. So I really enjoyed that. There were a lot of actors in that who went on to do better, or great things: Jude Law and Orlando Bloom were in that. There was a great company of actors, and working with Stephen Fry, who played Oscar, who I then went on to be directed by [in Bright Young Things]. A really fascinating man with a fascinating life and story. It gave me the opportunity to get a bit more experience working in front of the camera, so I felt a bit more relaxed doing that. AVC: To the degree that Midnight In Paris has a villain, you’re playing him. Woody Allen has used that intellectual blowhard character before, and he seems to authentically hate the type. How did he ask you to play that role? Did he encourage you to play it up? MS: No, he got me to play it down, if anything. He said, “You know, I think this character is sort of the ultimate peasant, and I think you might have some fun with him.” But in the actual playing of it, he wanted to not make too big a deal of it, just to be very simple with it, not to go too over-the-top, make him very real. Other than that, he sort of left me to it. MS: Given that he died at the end of the first film, to be able to go back and play the character again was great. Especially because he started out as a villain, and one of the things I enjoyed most about playing that character for the first time was to try and find a way for the audience to sympathize with him. By the time I got to do the third film, and to tell his story, it was really interesting to see how he turned into what he turned into. It’s a really enjoyable exercise to know where you have to end up, and to try and tell a surprising story about a character so you reveal aspects of it that people weren’t aware of before. I enjoy that too. As a general thing, I’ve always been drawn to characters who appear to be one thing on the surface, but are actually something else underneath. I’ve always enjoyed that, the challenge of taking characters who seem fairly villainous or monstrous, and finding a way to empathize with them. AVC: Given a choice on an average day between seeing a popcorn-y action film like Underworld or something more serious and involved like Frost/Nixon, which do you think you’d pick? MS: I think the films I’m in are a pretty good reflection of my taste, which is very varied. I only tend to really want to be in things if I’d want to go see them myself. My tastes are fairly wide-ranging, and the things I do are a reflection of that. I’m not someone who just sees one genre of film or one type of film; I enjoy going to see all kinds of different things. It’s very rare that there’s a mixture of the things I like all in one film, but I would point to—well, my favorite film of all time is a film called A Matter Of Life And Death, which was called Stairway To Heaven in America, by Michael Powell and Emeric Pressburger; that’s a film that combines sort of the real world with the more fantastical world. And a film in more modern times, like Guillermo del Toro’s Pan’s Labyrinth, [is] very much anchored in reality, but also has an element of the fantastic. Those are the things I’m most drawn to on the whole, but I’m as happy going to see something that is very much in the real world, or something that’s in a more fantastical world as well. MS: I suppose it was the first, and pretty much the only, time where the two great obsessions in my life came together, which was then soccer and acting. Before I got very involved in acting, I always wanted to be a soccer player. Being able to combine the two was fantastic. And such an extraordinary character as well; he was someone I grew up with as a child in the ’70s. He’s a huge figure in Britain, not just in the world of sports, but also in the world of entertainment as well. He was an extraordinary character, so to be able to actually get to be him for a short time was really exciting. MS: I loved doing that. It was great. It’s quite nerve-wracking to do out-and-out comedy. I’ve always enjoyed looking for the humor in the things I’ve done, but it’s very rare that I’ve got to do something that is pure comedy. Especially working alongside someone like Tina [Fey], who is so, so brilliant at it, and so smart, and so quick, and so sharp. It could have been quite intimidating, but actually, everyone was so generous and lovely to work with that it put me at my ease. It was really enjoyable to play a character who, the more I played that character, the more Tina wrote it more around what I was doing. That was a lovely thing, to see a character develop because the person you’re acting with is also the person who’s writing it. MS: It’s exciting to work with an actor who you really connect with, and feel like the only thing important to this person is doing the best job you can do and working together, and there’s no ego involved. You can really cover huge amounts of ground when you feel as trusting and safe with someone as I did with Maria [Bello] on this. The level of honesty and connection and trust that we had in working on it was quite remarkable, and exhilarating, and special. So that will be the thing I will always remember. AVC: In our interview with her, she said she doesn’t like rehearsals, and she also doesn’t do much research for a role; she wants to find the character in the moment. Is that simpatico with your style? MS: Not necessarily—I wouldn’t say I have a particular style, really. It depends on each project, and the requirements and needs as I see them on each thing. Some things are really great with a lot of rehearsal, and some things aren’t. Sometimes I do a lot of research—with the characters I’ve played who are real-life people, I’ve spent anything up to six months researching and rehearsing and working on them. And there are other things I haven’t done any research or rehearsal on in particular, so it really depends on each project. I plan and work out what’s appropriate and what fits, and the needs of each thing as it comes along. AVC: How do you determine that? Is it more in the script, or from interacting with other people who are going to be in the movie? MS: With something like Beautiful Boy, I didn’t feel the need to do a huge amount of research. I felt like the most important thing, looking at the script, in terms of what would help tell the story the best, it seemed like the best thing to concentrate on working on the right sort of relationship with me and Maria, given that we were going to spend so much time together on such intense material. It would just be the two of us, and we had a very short shoot—it was only 30 days, so we needed to have a really good working relationship. And for us to really bed ourselves into who these people are, and what’s this relationship like, and what’s the dynamics, and what’s the backstory. And then the aspect that I suppose we could have done more research about, which would be about looking into the experiences of people who had gone through something similar. Actually, in this case, I felt like the strongest element was that these characters have no idea what they were doing, or what the rules are, or what they should be thinking or feeling, or what’s the next step. So I felt like not knowing anything about it was probably more appropriate. So in this case, it was more to do with backstory, and me and Maria getting together and working things through, but on something else, it might be completely different.